The distinguished premium machine with absolutely superlative characteristics for both the gourmet and the aesthete offers perfect pleasure and makes coffee dreams come true: At the push of a button, it prepares two perfect cappuccinos fully automatically. And note that you don't need to move the cups around. Or would you prefer two latte macchiatos? Press the button  and enjoy. Free Standard Extra Items From Jura: These items are what Jura include with the machine, they are standard extras, you cant change these items, we have put their equivelent value to illustrate what you are getting with the machine. Free Extra Items From Red Monkey Coffee: What we give you on top of the standard items. Don't like some of these? No problem, they are flexible, apart from the delivery we can change any items for equivelent value items of your choice. Simply order & list what you want to change in the comments box on the order page (£2 leway) or freephone 0800 321 3357 or email. Plus pay by DEBIT CARD get an extra 1Kg of coffee or £16 to apply to what you want! 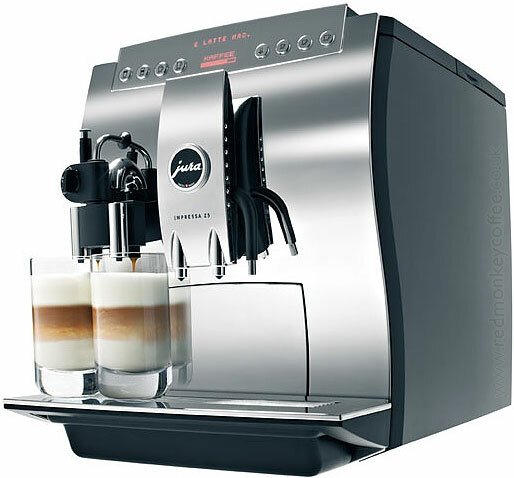 Simply by pressing a button once, and without having to move the cups, you can prepare two perfect coffee specialities such as cappuccino or latte macchiato at the same time. The IMPRESSA Z5 Generation II actively helps you to save energy. With the various levels of the E.S.M.© (Energy Save Mode©), you can adjust the energy saving potential to suit the way you like to enjoy your beverages. It doesn’t matter whether you are selecting the coffee strength, fine-tuning the settings for the amount of water etc. or giving your coffee specialities individual names: with the Rotary Switch you really can do it at the turn of a dial. Stars belong in the limelight. Therefore, the integrated cup lighting system provides magnificent illumination for every single speciality under the coffee spout. After all, pleasure can also be experienced by seeing. Note this shows Generation 1 Z5, Gen 2 has twin outlet. Also the milk container shown is now Stainless Steel. The digital assistant LEO will teach you all about the Jura Z5 Generation 2, virtually make drinks and see how the programming works.